"I remember when I shared samples of my very first pale ale," recalls Mark Irvin, head brewer at Bennidito's Brewpub. "People would taste it and say, 'This is so hoppy! Oh my god, what are you thinking?' But I knew that was where beer was going." 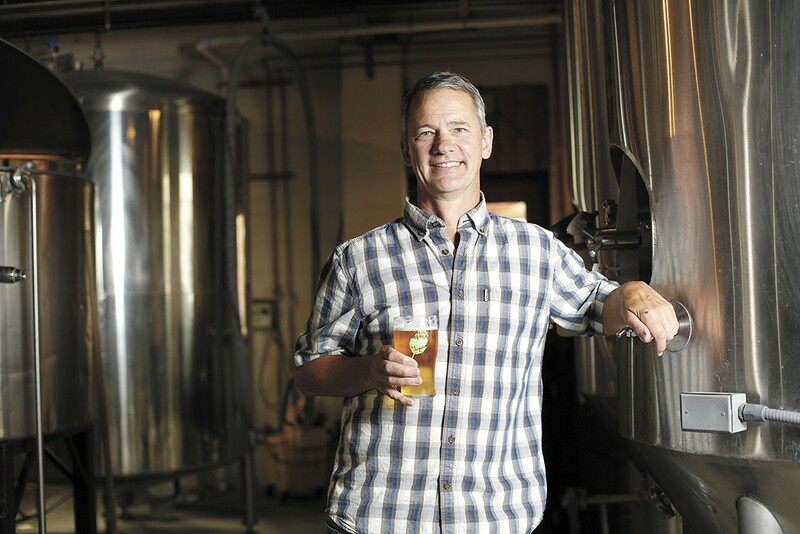 Irvin acknowledges that both beer and beer drinkers have changed a lot since the early '90s when he started his first brewery in Spokane, Northern Lights (now No-Li Brewhouse). But in reviewing his journey through the beer industry over the decades, it's clear there's been a constant element: his love of making beer. Like so many professional craft brewers, Irvin's first foray into making beer was through homebrewing. He began the hobby in the late '80s while attending Eastern Washington University to earn a degree in business. "At some point I wanted to own some form of manufacturing business," Irvin reflects. "I wasn't thinking beer — I just knew I wanted to make something." He started wondering if his growing passion for making beer could also lead him to his goal of owning a business. So he contacted Tom Fisher, then owner of Coeur d'Alene Brewing Company, about a job. After some persistence, Irvin was hired in an entry-level position at the brewery. "I spent my first day shoveling snow — I was the grunt-iest of grunts," he says. Over time, Irvin made his way into an assistant brewing position and became part of the process on a commercial scale. Not long after, in 1991, Irvin was offered a job to brew for Hale's Brewery in Kirkland, Washington. "At Hale's, you do everything. I really enjoyed that," he says. "It was cool being the Spokane boy and going into the jungle." After a year of brewing on the west side of the state, his work for Hale's brought him back home to Eastern Washington, where he assisted in both decommissioning the original Hale's facility in Colville and building a new brewing facility for the company in East Spokane. Once that project was complete, and now with significant brewing experience under his belt, Irvin decided he wanted to make his own beer. He left Hale's in 1993, but not before purchasing the 10-barrel brewhouse and other equipment from its defunct Colville location. He quickly found a warehouse space in Airway Heights to set up the equipment, and Northern Lights was born. In June of 2002, Irvin moved Northern Lights to its current location on the Spokane River, just off Trent Avenue. Still, he recalls that particular period as a tough time financially for the business. The microbrewery "bubble" had just burst. According to a 1997 report by the Brewers Association, growth in the craft beer industry had dropped from 58 percent in 1995 to just 2 percent two years later. A vast number of small breweries across the country, including several in the greater Spokane area, shuttered their doors. "It was tough in the new location at that time; our lease and utilities were higher. We were running a restaurant, which was new to me," Irvin says. "It was stressful." Despite the challenges, Northern Lights survived, and business gradually picked up over the next few years: "I was stubborn. I didn't want to give up. I didn't want to quit. I felt I had an obligation to my employees." That stubbornness paid off. By 2012, when craft beer industry veteran John Bryant (who's now No-Li's current owner) partnered with Irvin in the business, Northern Lights began to see major growth. That same year a vital rebranding turned Northern Lights into No-Li Brewhouse, and along with the new name came new logos, imagery and beers. Poised for another expansion to their facility, Irvin's little brewery was growing up, and fast. No-Li was gaining global recognition, earning national and international awards for its beers and making a name for Eastern Washington in the national craft beer scene. With No-Li's rapid success came a greater demand for its product, which meant that Irvin's role in the day-to-day brewing operations would need to expand as well. "I knew that the next phase was going to require I make a commitment to the business, really, over my family." Irvin says. "There was no doubt it would be a huge time demand." So in 2014, with both his sons heading into high school, Irvin decided to take a break from the brewing world and focus on his family. He sold his share of No-Li to Bryant, hung up his mash paddle, and left behind the brewery he began building more than a decade prior. For many of Spokane's craft beer veterans, it was the end of an era. Irvin's work and perseverance over the previous two decades in the region's craft beer scene had served as the impetus for other local brewers to begin their own businesses. Many a craft beer was poured upon the ground in honor of Irvin's legacy. Last fall, Chris Bennett, owner of Bennidito's Pizza in Spokane, contacted Irvin about taking over the brewing operations at his second, newer location, Bennidito's Brewpub. "I said, 'Sure, that sounds like fun,'" Irvin recalls. "Honestly, I was getting a little bored. You really don't realize how much you appreciate your routine of work" until it's gone. Irvin is now working to help build Bennidito's beer brand and increase its distribution as he dials in some of its current brews and cranks out new ones. In many ways, Irvin has made a return to his early days of brewing. He's back working on a 10-barrel brew system, like the one he first purchased when he founded Northern Lights. His brew schedule is a little more relaxed, as it's dictated by the demand for Bennidito's beer within a very localized distribution footprint. And he has the freedom to experiment more with beer styles. "It allows me to keep my skills sharp, to continue to brew beer — which is what I like to do — and to create; to taste each beer and evaluate how I missed the mark, and how I did things right," he says. With 20-plus years of professional brewing experience, Irvin says he still gets surprised and has new learning moments when making beer at Bennidito's. These realizations are what drives him to continue honing his craft. Reflecting on his role in the region's craft beer revival, the details all seem to point back to what drove Irvin to make beer in the first place: "I like making beer because I like creating. I get to be creative and make beer I can enjoy with friends." ABOUT THE AUTHOR: Adam Boyd is an award-winning homebrewer, assistant brewer at Iron Goat Brewing, and the festival director of Spokane International Film Festival. What's your favorite part of the brewing process? Mashing in. I love the heat, the steam and the smell. Besides beer, do you have another favorite beverage you enjoy? I'm new to kombucha, but I absolutely love it. I think brewers could learn a thing or two from kombucha makers with the flavors they use. I love to water ski, play the guitar and barbecue. I have a Traeger grill I use more than anyone else I know.